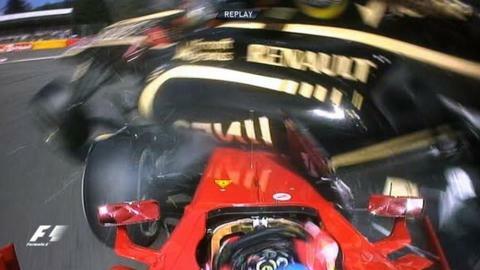 Belgian Jerome D'Ambrosio will replace the suspended Romain Grosjean for Lotus at the Italian Grand Prix this weekend. Grosjean, 26, was handed a one-race ban for causing the first-corner crash at the Belgian Grand Prix on Sunday. Reserve driver D'Ambrosio, 26, played a part in Lotus's testing in pre-season and drove for Virgin Racing last year. "My desire for 2012 has always been to get back into the seat of a Formula 1 car so I am grabbing this opportunity with both hands," said D'Ambrosio. "As third driver, I have worked with the team at every grand prix, attending all the briefings and meetings that the race drivers do, so I am well prepared in this respect. "I want to reward the faith that the team has in me with a good haul of points from the race." Frenchman Grosjean will return at the Singapore Grand Prix, but Lotus team principal Eric Boullier has backed D'Ambrosio to make an impression at Monza this weekend, despite 14th being the Belgian's best finish last season for Virgin Racing. "When we signed Jerome as our third driver we signed a man who is highly motivated, fresh, talented and who contested the full 2011 season," said Boullier. "Now he has the challenge of a grand prix at the challenging circuit of Monza, in a car which is capable of finishing on the podium."